L. – R. Jenny Reber & Jacob Gerard Barnes. Courtesy of Ed Stewart. Used with permission. 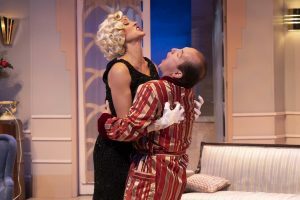 If you like action-packed screwball comedy that is broad and physical, then you will be as highly entertained as I was when I saw Actors Theatre of Indiana’s “A Comedy of Tenors,” Saturday at the Studio Theatre at the Center for the Performing Arts in Carmel. Written by American playwright Ken Ludwig, the production runs through September 30. As can be expected with a farce, the entangled plot is replete with improbable situations, mistaken identities, slamming doors, romance and boisterous humor. Set in a Paris hotel in the 1930s, the rollicking tale involves four tenors, two wives, three girlfriends and a concert of the century taking place in a soccer stadium filled with frenzied fans. Standing in the way of the “concert of the century” actually occurring, however, is an egomaniac Italian superstar and his volatile wife who threaten the huge investment made by the concert’s short tempered- producer. L- R Brynn Tyzska & Don Farrell – Courtesy of Ed Stewart. Used with permission. Impressive, indeed, was Darrin Murrell’s tight direction. His carefully choreographed blocking was wondrous to behold, as were the comic actors with superb timing, who executed it to near-perfection. They included Mark Fishback as Saunders, Nic Eastlund as Max, Amy Bodnar as Maria, Don Farrell as Tito, Jenny Reber as Mimi, Jacob Barnes as Carlo and Brynn Tyszka as Racon. Standing out was Barnes as guileless tenor Carlo Nucci, who dates Tito’s Merilli’s daughter Mimi. Possessing leading man good looks, Barnes showed dexterity as he executed some difficult yet hilarious pratfalls. Showing a strong stage presence was Indy theatre newcomer Tyszka as Tatiana Racon, a fiery Russian opera singer. Looking glamorous in a sequined, floor-length black gown (designed by costumer Katie Cowan Sickmeier) and wearing white, opera-length gloves and a blonde finger-wave wig (designed by Andrew Elliot) Tyszka showed comic flair with her hilarious double takes and spot-on timing. Highlights in the show included a performance by the characters played by Eastlund, Farrell and Barnes singing “Brindisi” (“The Drinking Song’) from “La Traviata,” during which they demonstrated more than passable operatic skills. Spoiler Alert! At the end of the show, the cast does a complete reprise of the entire show, except that it is done backwards and at break-neck speed, concluding an evening of pure delight and glorious escapism.